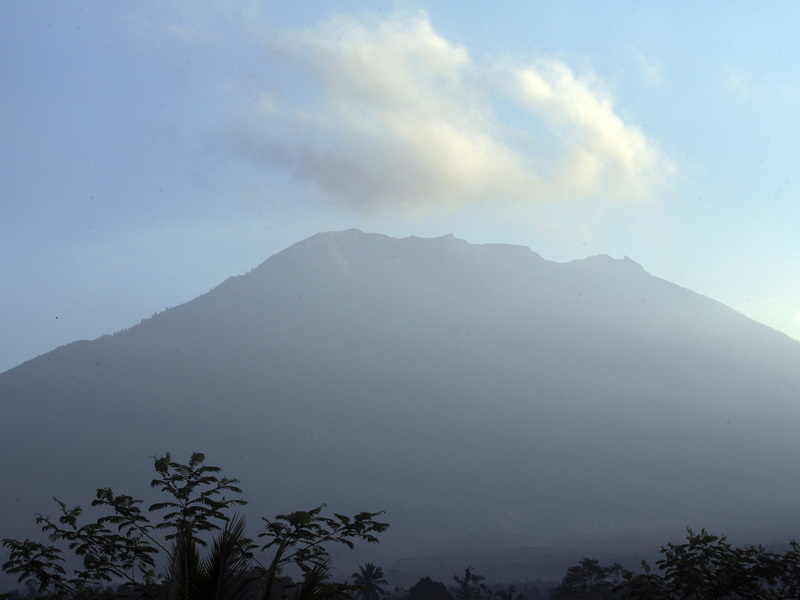 Residents, tourists and climbers are being told to stay far away from Mount Agung, a large volcano in Bali where hundreds of shallow volcanic earthquakes have been recorded in recent days. The volcano’s last eruption, in 1963, killed more than 1,000 people. “The disaster mitigation agency said 48,540 people had fled and the number was expected to rise because more than 60,000 people lived in the danger zone,” Agence France-Presse reports. The government has imposed a 12 kilometer (7.5 miles) exclusion, or “danger zone” around the volcano, according to the Associated Press.People who live in the area are being warned to prepare masks and other gear that could protect their nose, mouth and eyes. “If an eruption occurs, there is considerable disaster potential. This can happen because today many people live in disaster prone areas. In addition, people around Mount Agung also do not have enough experience to face the eruption of Mount Agung because this volcano last erupted in 1963 (54 years ago),” said Indonesia’s volcano monitoring body, MAGMA, as quoted by Australia’s news.com.au. Edwin Delgado Rivera stands behind the counter of his oyster shack in Loiza, Puerto Rico, which sustained heavy damage by the destructive path of Hurricane Maria. Outside of his little business on the side of the road in a small town in Loiza, Puerto Rico, Santiago Quiñones adjusts a small solar panel. It’s charging a floodlight, to illuminate the cramped space at night. He takes it down and demonstrates how it works. “You can’t see right now because it’s daylight, but it’s already charged,” he says in Spanish. 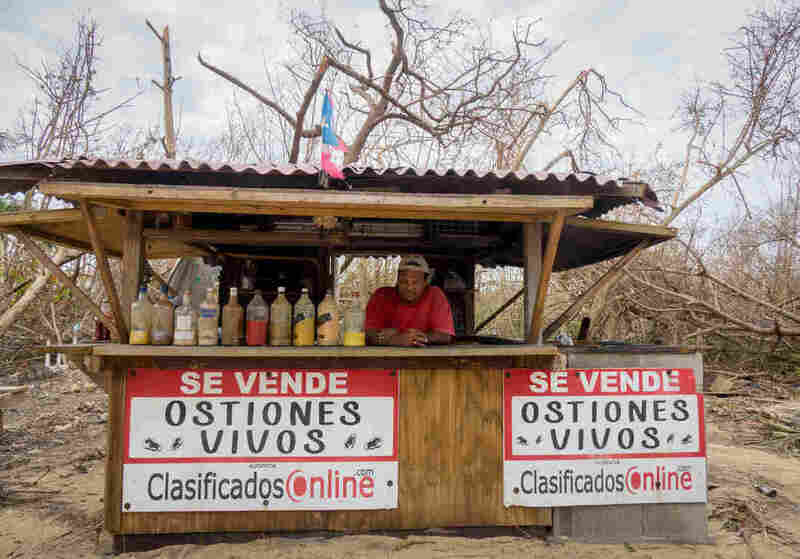 Like everyone else in Puerto Rico, 73-year-old Quiñones has lost access to the power grid. 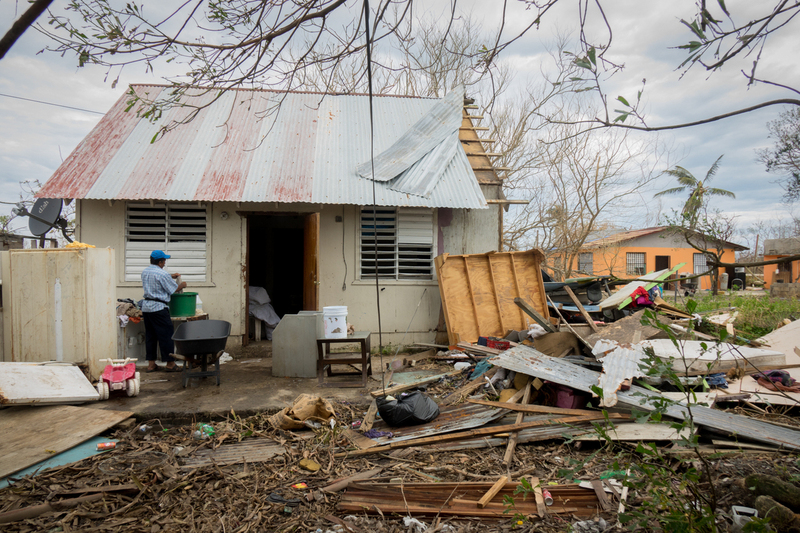 His house was also badly damaged by floodwaters when Hurricane Maria swept over the island. 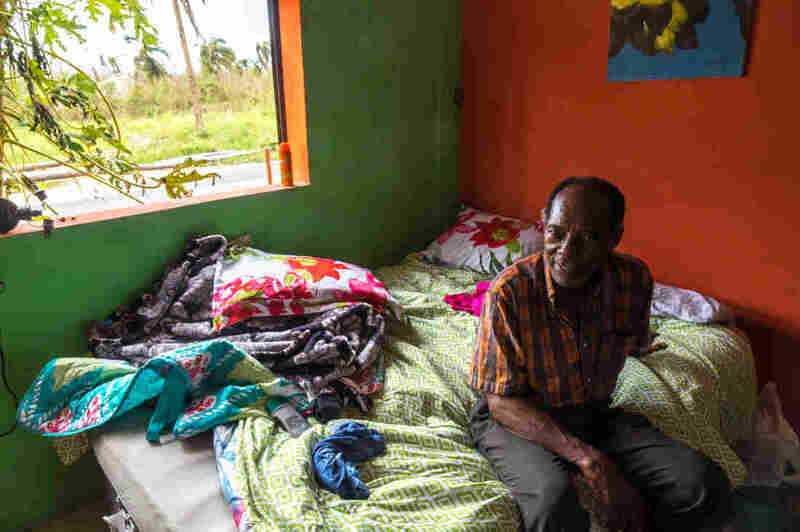 Santiago Quiñones Escalera, 73, sits on an air mattress he and his wife are sleeping on in Loiza , Puerto Rico, which sustained heavy damage by the destructive path of Hurricane Maria. Quiñones owns the bar/restaurant in front of the ocean and he decided he and his wife should ride the storm out there. Fortunately the building held up. They use a generator and solar-powered lighting. So he and his wife are living across the street, using a bed set up in his shop, which survived the storm with relatively minor damage. They have a generator powering, among other things, a TV in their makeshift bedroom. And to help see at night there’s the solar panel and some rechargeable battery-powered lights. They bought the light three months ago “for the storms,” Quiñones says. They’d heard it could be a dangerous hurricane season this year. All over the island, people are facing the challenging task of recovering from the damage wrought by Maria — and simultaneously grappling with a power outage that won’t be over for weeks at the least. In the streets of Loiza and Rio Grande, municipalities just east of San Juan, the daunting scale of the problem is easy to see. Power lines dangle dangerously across coastal roads. Dozens of wooden telephone poles, in a continuous line, have toppled to the ground. Concrete power poles have snapped completely in half. The effect on the island is visible from space — at night, Puerto Rico has gone dark. The only light comes from buildings with generators. And inside the dark spots on the map, people are trying to cope with whatever they have left. Fisherman Justino Rodriguez Rivera, 53, washes clothes with water from a well in Loiza, Puerto Rico, which sustained heavy damage by the destructive path of Hurricane Maria. Rodriguez and his wife evacuated to their church. In Torrecilla Baja, in Loiza, fisherman Justino Rodriguez Rivera, 56, is washing clothes — by hand — outside his daughter’s house. His own home was destroyed in the hurricane, the roof ripped off completely. He fills another bucket with well water and carries it from one stoop to another. 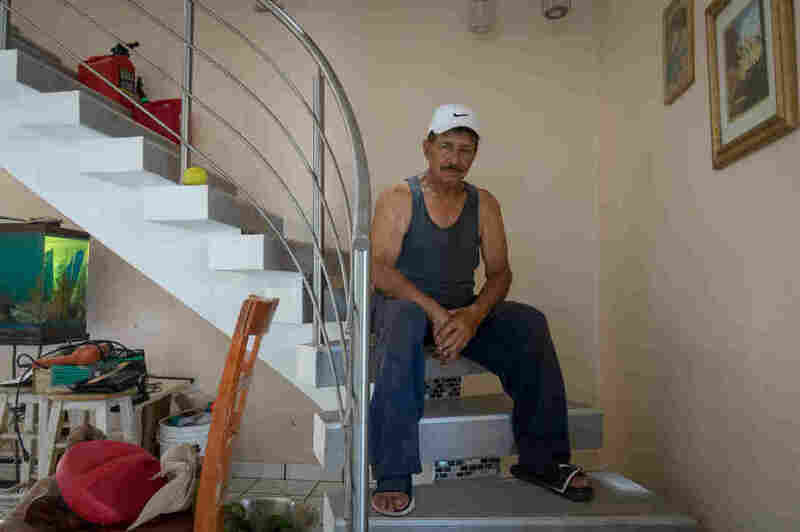 A little to the south, in Canovanas, retired boxing instructor Jose Torres, 72, is sleeping on a chair in his balcony. It’s too hot inside the house without power. During the path of Hurricane Maria, Jose Torres kept repositioning the gas jugs behind him as the water rose inside his house. He is a diabetic and lost all his medications when his two-story house was flooded up to seven feet. He lost all his medicine when his home flooded. He has diabetes and hasn’t tested his blood sugar in days. He’s trying to eat consistently to keep his blood sugar in check — but it’s hard, because their stove relied on power and the food in the fridge all spoiled. “All the meat, we threw it away. Or — we didn’t throw it away, we cooked it for the dogs,” he said. “The dogs are eating better than me now,” he says. “I’ve got some bananas and yautia,” he said, referring to a root vegetable that grows in the Carribbean. “My sister gave me a gas [stove] and my wife cooked rice yesterday,” he said. 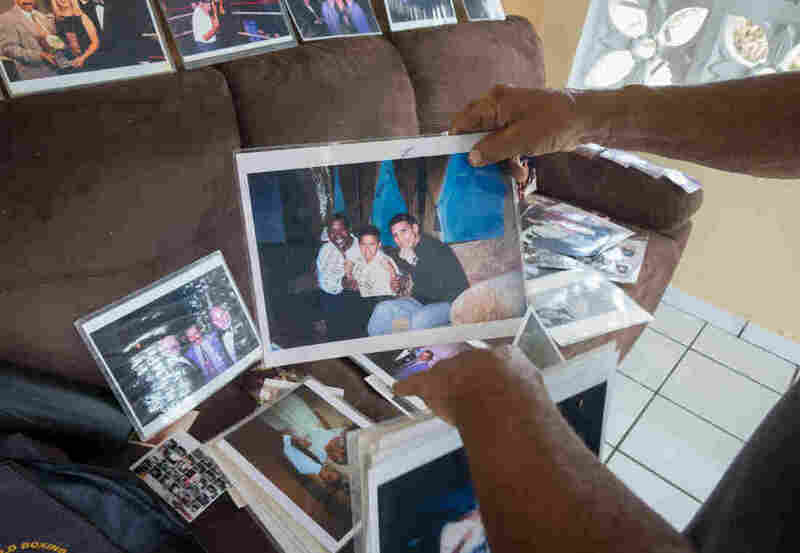 Jose Torres’s rearranges some of the photos he was able to save in his home. Amparo Ventura is sitting outside her restaurant, Puerta del Mar, in the coastal town of Piñones. She had a plan. She has a generator and enough fuel to last for days. But that’s not enough to bring nearby residents, many of whom have lost cars or lack fuel, venturing out on the sand-covered road along the coast. The only people in the parking lot are employees clearing away debris. 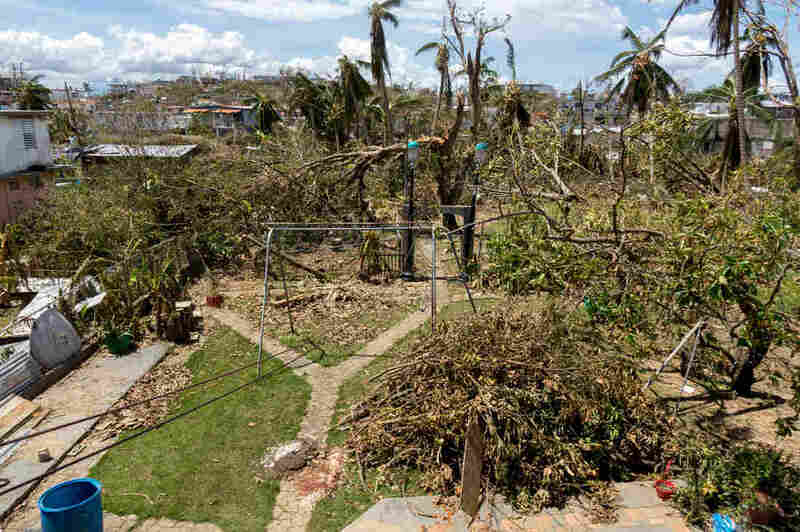 Jose Torres’s backyard after Hurricane Maria. The hardest thing after the storm, Ventura said, was that she didn’t have any work to offer her employees, and couldn’t pay them. Now, her generator is running. Her lights were on. Her doors were open for anybody who could make it. “I’m here trying,” she said. 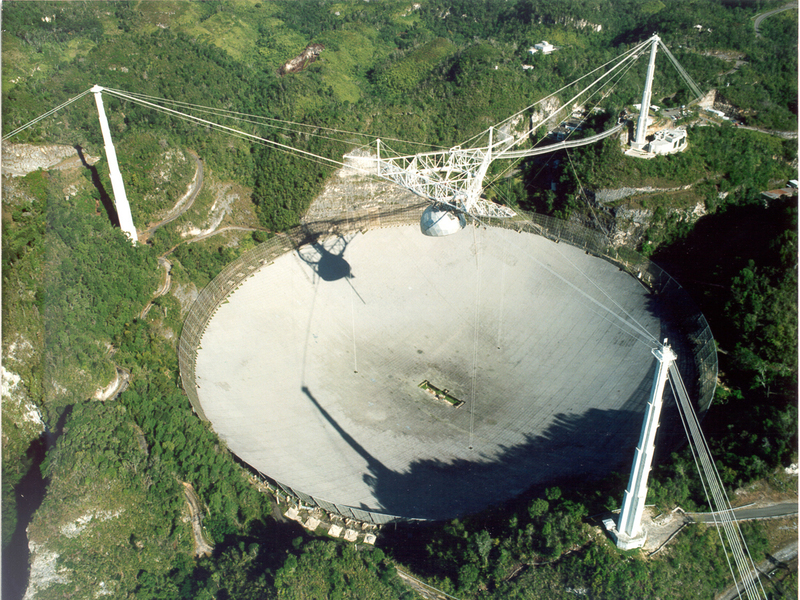 Until it was surpassed recently by a similar instrument in China, the Arecibo radio telescope in Puerto Rico, completed in 1963, was the world’s single largest. As all this was happening, the observatory’s staff sheltered in place. Reports are that everyone is OK. On Sunday, the team managed to post a defiant message to Facebook showing two of the staff displaying an outstretched Puerto Rican flag, with the giant dish in the background. And then there’s the Arecibo Message, a famous signal sent from the radio telescope to M13, a global cluster some 25,000 light years away. For any sentient extraterrestrials there, it describes who we are and where the signal comes from. (Don’t hold your breath though, as it’ll be at least 50,000 years before we get an answer). One of Arecibo’s primary areas of research is near-Earth objects, or NEOs, those asteroids and asteroid-like chunks of rock that pass uncomfortably close. Lance Benner, a scientist at the Jet Propulsion Laboratory in Pasadena, Ca., who studies NEOs, has traveled to Arecibo dozens of times and tells NPR it’s probably the best place anywhere to do such research. But the aging facility’s funding from the National Science Foundation has been under review for the past few years, and it’s unclear how the cost of any repairs might affect that discussion. The proposal the Senate is considering that would repeal and replace the Affordable Care Act will result in millions losing health insurance and a $133 billion reduction in the deficit by 2026, according to the Congressional Budget Office’s report on the Graham-Cassidy legislation. The CBO did not have enough time to estimate specifically how many people’s insurance would be affected as they have done when they have scored previous repeal bills. But, the analysis it released Monday evening says, “the number of people with comprehensive health insurance that covers high-cost medical events would be reduced by millions” compared to current law. The bill also changes Medicaid by capping the federal contribution by giving states a fixed amount per person and increasing it at a rate that is slower than health care inflation. CBO says it can’t do a complete analysis of the plan in the short window requested by lawmakers. Senate Republicans are looking to vote on the bill this week, before a deadline at the end of September would require they get support from Democrats to be able to pass the legislation. Earlier proposals to overhaul the health care system failed in part because the CBO analyses showed tens of millions of people were likely to lose insurance coverage because of the proposed changes. The major drivers of those losses, according to the CBO, were the loss of the individual mandate that requires people to buy insurance and the rollback of the expansion of Medicaid that was allowed under Obamacare. The latest proposal includes both provisions, so some analysts say the results will be the same. An analysis by the Brookings Institution estimates that about 21 million people would lose coverage under Graham-Cassidy compared to the current law through 2026, and eventually 32 million people would lose it due to the block grant funding changes. And a separate report by the health care consulting firm Avalere Health estimates that states would lose about $700 billion in federal health care funding over 10 years, and $3.5 trillion over 20 years. 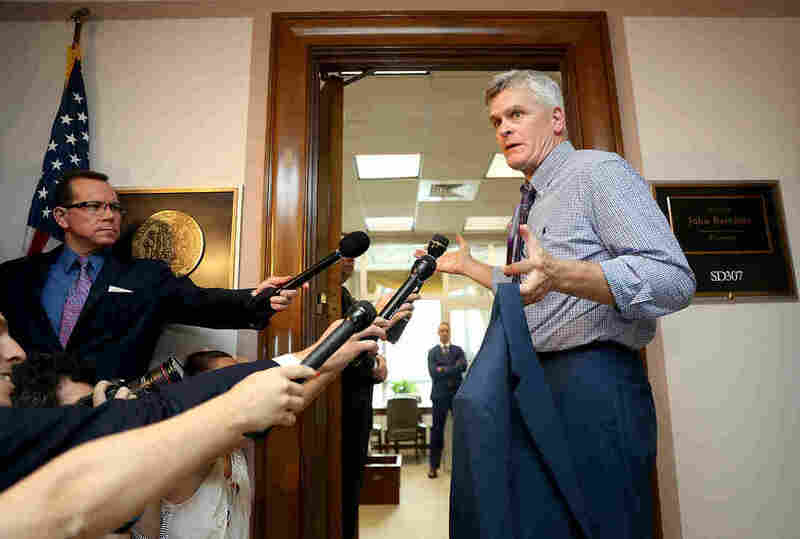 The bill’s sponsors, senators Lindsey Graham, R-S.C., and Bill Cassidy, R-La, introduced a revised bill on Monday. “Whatever the CBO score is will be superseded by another score later this week,” Cassidy said on ABC’s This Week on Sunday. Sens. 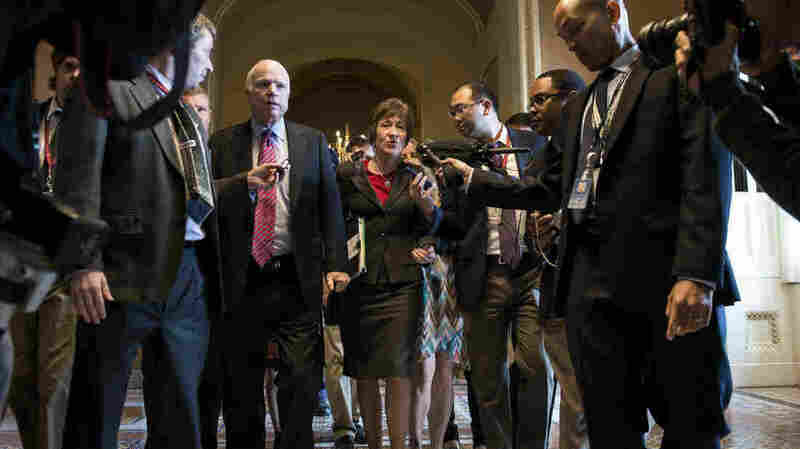 John McCain, R-Ariz., Susan Collins, R-Maine, in a 2013 file photo. They along with Sen. Rand Paul, R-Ky., have announced firm opposition to the latest GOP health care bill. The latest Republican push to repeal key parts of the Affordable Care Act appears to have met the fate of all previous Senate repeal efforts this year – it doesn’t have the votes needed to pass the chamber. Maine Sen. Susan Collins announced Monday that she’ll oppose the bill, authored by South Carolina Sen. Lindsey Graham and Louisiana Sen. Bill Cassidy. Collins’ decision means three Republicans have now publicly said they are against the bill – and that’s one more than the GOP could afford to lose. Cassidy was asked earlier Monday on CNN whether Collins’s opposition would mean it’s over for the bill and said, “Yes, it is.” It’s not clear yet whether Senate Majority Leader Mitch McConnell would still bring the bill to the floor for a vote now that it’s fate is clear. Collins has been a steady skeptic of the Republican repeal push all year, regularly raising concerns about how the various repeal incarnations would affect the millions of people who rely on Medicaid, especially in states that chose to expand their Medicaid programs under the Affordable Care Act. She had previously indicated she’d likely vote no, but said she’d withhold a final judgement until after the Congressional Budget Office released its analysis. That analysis came out Monday evening, and found the bill would reduce the federal deficit by $133 billion by 2026, but was only a partial analysis due to the limited time CBO has had to examine it. The analysis does not have specific projections on how the bill would affect coverage, but says “millions” fewer people would be covered as funding decreases for Medicaid, subsidies for exchanges and the elimination of the individual mandate to have coverage. The Graham-Cassidy bill would transform Medicaid, giving states, not the federal government, control over how the bulk of billions of dollars in funding is spent. It would also allow states to waive key Obamacare regulations and protections, including the bill’s trademark ban on insurance companies charging higher rates to people with preexisting conditions. Collins joins Arizona Sen. John McCain and Kentucky Sen. Rand Paul as firm “no” votes on Graham-Cassidy. While Republicans have until Saturday to pass the bill with a simple majority, and Cassidy has already announced changes to the measure’s text, it’s hard to see how any of the three lawmakers change their mind. President Trump called into the Rick & Bubba Show, a talk radio program in Alabama, to discuss the GOP senate primary happening there on Tuesday and took the opportunity to criticize Republicans as the bill looked imperiled. Collins, McCain, and Paul have each voiced separate, fundamental problems with either the bill’s content, or the repeal process as a whole. None of their concerns could be easily fixed by changing funding formulas. What’s more – a move to assuage Paul’s concerns would likely make Collins more opposed, since Paul’s chief complaint is the measure keeps too much of Obamacare in place, and Collins is worried it would erode key protections promised by the law. Indeed, Paul’s office has already said that, having seen the new amendments, Paul remains opposed to the bill. “My main concern is that the main thing this bill does is reshuffle the money from Democrat states to Republican states but doesn’t fix the problem,” Paul told reporters, calling for more “freedom in the marketplace,” including the ability to buy insurance over state lines and allow people to buy cheaper plans that provide less coverage for care. Other Republicans are wavering, too. Texas Sen. Ted Cruz said over the weekend that he’s not yet ready to publicly support the bill. Alaska Sen. Lisa Murkowski – who along with Collins has been a prominent skeptic of the entire repeal process – hasn’t announced where she stands, either. Still, given the immense pressure Republicans are facing from their base constituents and conservative donors to repeal Obamacare – not to mention constant criticism from President Trump – the Senate could still proceed to a vote later this week. Lisa Martini, with Enterprise Holdings, the nation’s largest car rental company, says that in anticipation of this hurricane season, the company started getting ready to send cars. 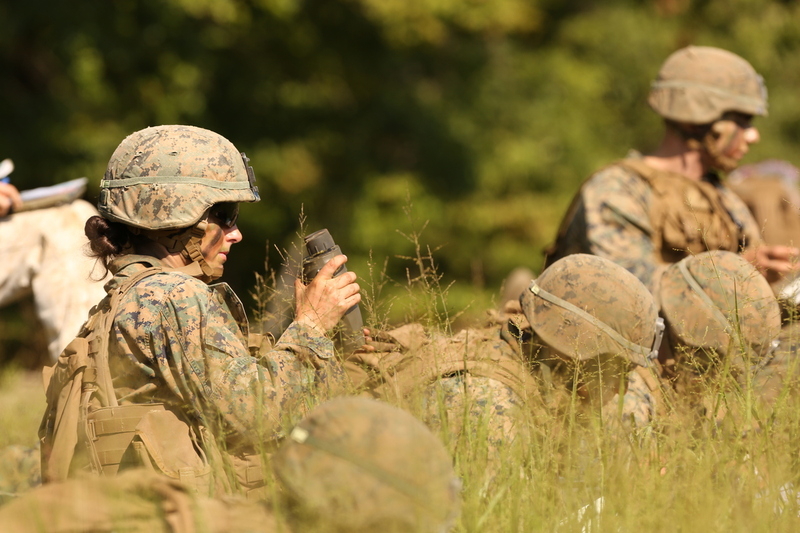 “For example, in Texas we started anticipating the replacement vehicle need … . We brought in about 17,000 vehicles in Texas and that was part of that recovery process,” she says. First responders, officials, volunteers, residents and reporters need cars in the immediate aftermath of a disaster, Martini says. “We really just understand where the demand is highest and, especially when a disaster hits, we just move those vehicles where they’re needed,” she says. That shift could have had an effect on vehicles in, say, Washington state. Martini says that for a couple of days, renters who didn’t have an insurance claim might have had to wait a little bit longer. “The Mustang might have not been where you would have hoped it would have been,” she says. 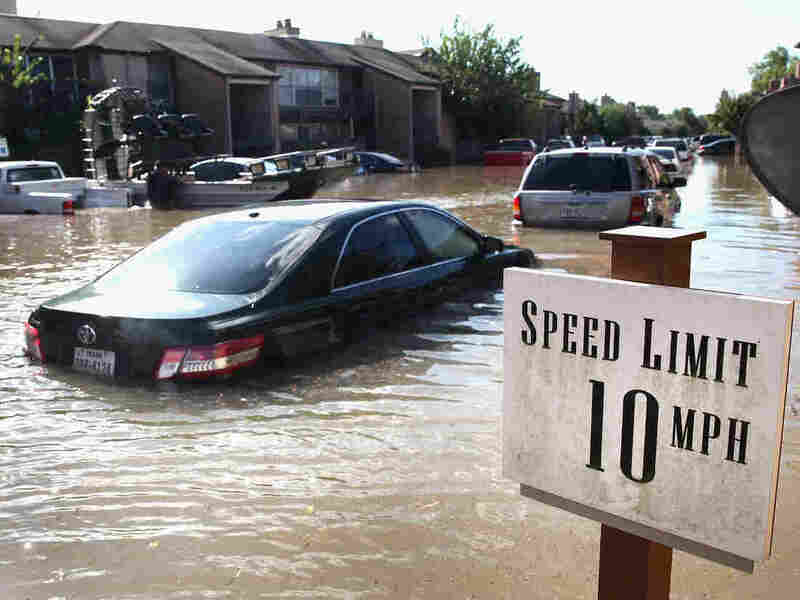 Chris Brown, executive editor of the trade publication Auto Rental News, says preparing for natural disasters is a part of the DNA of the rental car companies. Moving the 2.1 million vehicles in the rental fleet around the country is a microcosm of what’s to come. Brown says fleet management is paramount to a successful operation. “But more than that, it only gets more important moving forward into this era of autonomous vehicles,” he adds. 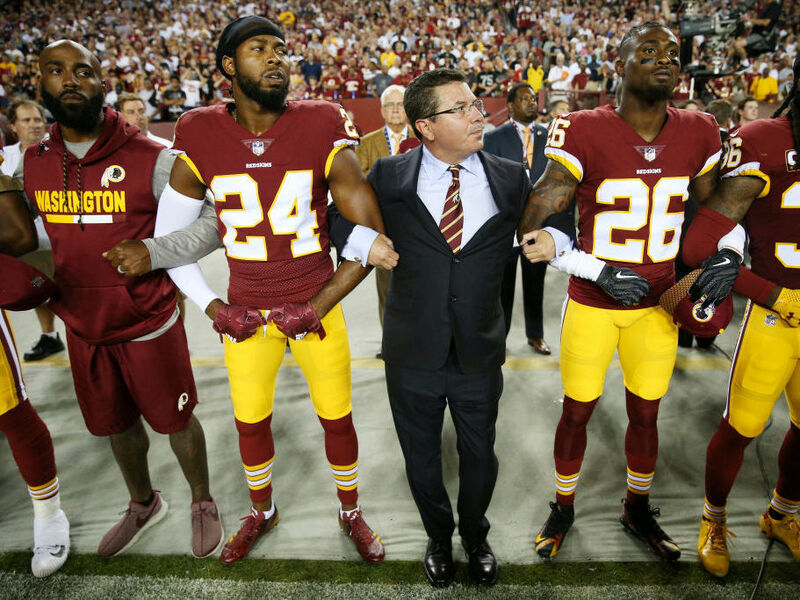 Washington Redskins Owner Daniel Synder stands with players during the national anthem before Sunday night’s game against the Oakland Raiders. Last year, NFL quarterback Colin Kaepernick began kneeling during the national anthem to protest racial inequality. Over the course of the season, other players joined his protest by kneeling, sitting or raising their fists during the anthem. The National Football League and its Players’ Association both issued statements supporting their players’ rights after Trump’s comments on Friday. Defensive end Julius Peppers remained in the locker room for the anthem, while the rest of the team stood. The team has yet to issue any statement regarding Trump’s comments or protests around the league. Tight end Tyler Eifert, who is injured and did not make the trip to Green Bay for their game, had previously spoken to the Cincinnati Enquirer and wrote a statement on Medium about why he makes a point of standing for the anthem. At least 20 players knelt, while others stood and linked arms during the anthem, and owners Jimmy and Dee Haslam called Trump’s comments “misguided, uninformed and divisive” in a statement supporting their players. Before an earlier game this season, the team played a video in which players discussed racial inequality. The Fort Worth Star-Telegramreported Cowboys players plan to protest during the anthem before Monday night’s game. Owner Jerry Jones has previously said he feels “so strongly” about recognizing the flag and has not yet issued any statement regarding Trump’s comments or protests around the league. The Rams played on Thursday night, before Trump’s comments. At that game, linebacker Robert Quinn raised his fist during the anthem, as he has throughout the season. On Sunday morning, Rams owner Stan Kroenke issued a statement supporting his players’ freedom to protest. The Steelers remained in the locker room for the national anthem, with the exception of Alejandro Villanueva, who stood just outside of the tunnel. Villanueva is an Army veteran who served in Afghanistan. On Saturday, team president Peter McLoughlin issued a statement supporting his players’ freedom of speech. The Titans remained in their locker room for the anthem and later issued a statement about their decision, while singer Meghan Linsey knelt after performing the Star-Spangled Banner. Earlier, owner Amy Adams Strunk released a statement supporting her players and Goodell. On Sunday, Oakland Athletics catcher Bruce Maxwell became the first Major League Baseball player to join the anthem protests by taking a knee before his team’s game. Before the WNBA finals began on Sunday, the Minnesota Lynx joined arms on the court, while the Los Angeles Sparks returned to their locker room during the anthem. Nine players stayed in the locker room for the national anthem before a NWSL game on Sunday, including Megan Rapinoe, who has previously knelt during the anthem. In this session of World Cafe, we’ve got four superstar musicians for the price of one: Carlos Santana, one of the greatest guitarists of all time; Cindy Blackman Santana, a virtuoso jazz and rock drummer who spent decades as the backbone on world tours for artists like Lenny Kravitz, and her now-husband Carlos; and Ron and Ernie Isley, the two main surviving members of the legendary Isley Brothers. Carlos, Cindy, Ron and Ernie have teamed up for a new album, Power of Peace, consisting of a dozen covers and one original song focused around music’s ability to heal and unify. The idea originated at Carlos and Cindy’s wedding, in 2010, when the pair chose Ron Isley’s cover of “The Look of Love” for their first dance. Hear songs from the record as I chat with all four of the musicians, in the player above.